Here’s how it happened: I invited Toronto Blue Jays fans all over the world to record themselves on their mobile phones – singing, yelling or chanting the chorus lyrics of this new Blue Jays anthem. These individual voices were merged to create a stadium-like group vocal and added to the band tracks recorded here. When I mixed the song and played it back through the main monitors for the first time – I got goosebumps and the hair stood up on the back of my neck. It was a feeling I’ll never forget. 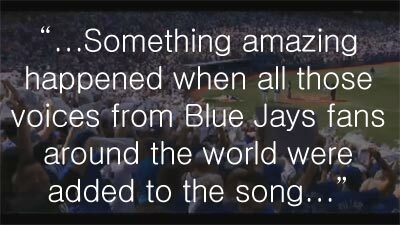 “…Blue Jays fans everywhere would love to see their song climb up the U.S. music charts. But the things that are most worth doing always seem unrealistic at first – Everything about this project was unique and unrealistic when it started. And now? Everyone wants to take this project one step further. So, is getting this project on the music charts do-able? Yes! Drop your info into the form below to pre-order LOOK WAY UP. What happens then? That will reserve your copy of the special surround-sound master of this unique project, and you will also push it one step higher on the U.S. music charts. The LOOK WAY UP pre-ordered special surround-sound master? .99 cents. Seeing The Blue Jays anthem invade the U.S. music charts? Priceless. We just gotta do this. A Massive Collaboration of Toronto Blue Jays Fans Around The World With Owen Critchley.